It's been rainy and cold the past couple of days here at Rosehaven Cottage. So I decided to post some photos of the sunnier days in our winter garden to brighten up the otherwise chilly and damp day. 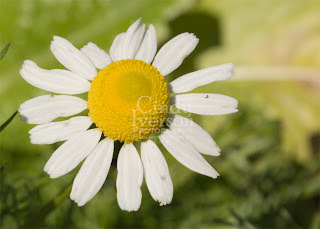 Above: A tiny and dainty chamomile blossom grows in the raised planters along with the winter lettuce. Growing herbs in with other tender plants helps to provide decoys for insects and other predators so they leave the delicate edibles alone. This chamomile is doing its job quite well. Above left: A gorgeous broccoli leaf in all its winter glory. Here in the Bay Area broccoli is a winter vegetable since it prefers cooler temperatures and our late spring and summer temps are much too hot for its taste. Above right: The brilliant yellow of the winter lemons are one of the few spots of color among leafless trees. Even the lemon tree that they are growing on is devoid of most of its leaves. 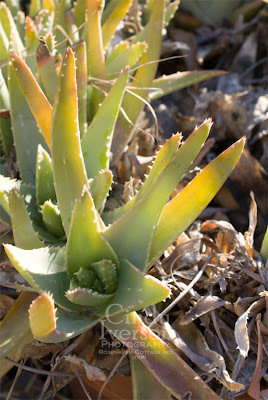 Above: Aloe will grow like a weed around here if planted in the ground. This transplant once was growing out of control in a large area of the garden when we came to Rosehaven Cottage. Since space is at a premium, I transplanted the aloe into two large terra cotta pots and they have thrived there ever since. A final note... if you love gardens as much as we do, go check out Blotanical, a directory of more garden blogs than you could imagine! And if your garden blog isn't already there, it should be! Even if you've got a brown thumb, it's worth checking out just to see all the gorgeous gardens. Don't hesitate to ask about a special request. There is no additional cost for customization, and it's free to ask. Mmmmmmm, those lemons look delcicious, wish I could grow them outside too. Soon it will be time for sowing broccoli seeds. This year I'm trying out a new variety, a purple one. I love the camomile flower. Such a simple looking flower. Those lemons are gorgeous! Do they smell as good as they look? Cindy, I can believe that about the aloe, because the one I have here in a pot has made about four babies in about as many months! It's outgrown the container, so I really need to divide it and get the babies potted up. I had it inside last winter, when I first bought it, and it struggled, then I put it outside all summer. At the end of the summer was when it went crazy and grew so well. Some day, I hope to pick a lemon off a tree and eat it...just the thought of a truly fresh lemon makes my mouth water. (sigh). The ones in my fridge just don't cut it. A lovely post, Cindy, nicely arranged. 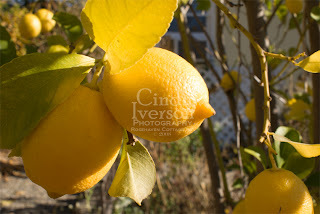 I can't believe how brightly colored and plump the lemons remain, even when the leaves have browned and fallen! Your bright and cheerful photographs put a smile on my face! Maybe we'll see the sun next week.. I like the first photo the best, because it reminds me of a daisy. And daisies are my favorite flower! Hi Cindy, sorry it's been a long time since I have posted a comment, I haven't been on the computer. It's good to see you have been getting better weather than what you had when I was last on. The yellows in the photos do a lot to cheer me up on this grey day in SoCal. I keep reminding myself, rain is good, rain is good, but I miss my sunny yellow and blue sky. Thanks for the sunny photos. Yesterday the temperature was -6 where I live so your pictures were a cheerful reminder that it won't always be like this. My daughter sent us a potted lemon-orange tree for Christmas. It smells like lilacs...I haven't been lucky in the past with indoor fruit trees but hopefully this one will change that. Nice flower pix, but I want more Lucy updates so I can see her when I'm at work. 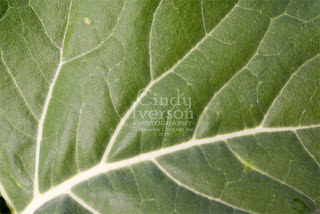 Ah Cindy - what great garden pics! I am really enjoying your garden on the other side of the continent! We've been buried in snow and sub zero temperatures... and even a hint of green would be welcome right now! My husband's from the caribbean and well, it grows like a weed there, too.. and they (we!) use it for everything from minor scrapes to preventive flu-medicine..
We always take home a big jar full of aloe choppings (the white parts) on oil, to use here in icey cold holland when we need a little kick ;) It tastes terrible though, have you tried? Alright, I officially want to live in your cottage. What fabulous photos, and kitty Lucy is adorable. It so good to see the lemons! I'm dreaming of Italian Cypress and olive trees! Thanks for the pretty photos! We survived "The Monster Storm"
I have an excuse... it's tradition!